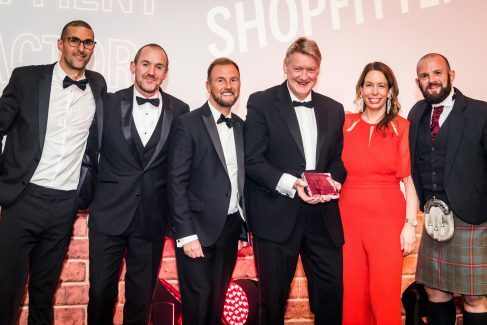 National interior fit-out specialists for the food retail and hospitality sector, Jephsons Shopfitters, was given the highest possible accolade by its oldest client, when it was recently named KFC Contractor of the Year for 2018. The award was presented at KFC’s annual prestigious ceremony held at the Hilton Hotel, where the global food brand recognises the value of its UK working partners. Jephsons has been specialising in interior fit-out services for over 50 years, developing what it believes to be unparalleled experience in managing turn-key projects for some of the best-known global brands in the food retail and hospitality industries. Among its other clients are Costa Coffee, Taco Bell, Pizza Hut and several independent restaurants, bars and cafes. It narrowly missed out on being named Costa Coffee Contractor of the year when it came runner-up in those awards this year. “We like to think that being recognised by clients in this way reflects the added value that we build into our services. These are difficult and changing times that we are currently living through, times when you need to know that you are placing yourself in good hands, that you are putting your faith in a provider you can trust. We thank all our clients for that confidence and hope to carry on showing that it is well founded for many years to come,” said Jephsons’ Operations Director, Nigel Schofield. From its East Midlands’ base in Mansfield, Jephsons manages projects from Jersey to Scotland and from East Anglia to the Republic of Ireland. It has over 10,000 square feet of manufacturing workshop space and a team of over 50 specialist joiners and fitters that work in hardwoods, softwoods, laminates, Corian, and various sheet materials including MDF. The company uses cutting edge CNC machining which when combined with its own spray booth and finishing facilities means that is has no issue in managing consistency across repeat and large-scale projects. "Being a Costa Coffee franchisee means maintaining a brand that is known for presenting itself in the right way. I like to give my customers a brand experience every time they come into one of our cafes, and a key part of that is in making sure the fixtures, fittings and furniture are manufactured and installed just as I want them to look and feel. Since 2014 we have been using Jephsons Shopfitters to re-fit and fit-out our cafes. I’ve always been pleased by the company’s attention to detail and the quality of the joinery – even when we have commissioned supply only fittings, the workmanship has always been of a very high standard. Jephsons are a good company to work with and I’m happy to recommend them to other Costa Coffee franchisees. Danny Kent, Director of Business Development A & I Scoffs Group t/a Costa Coffee"